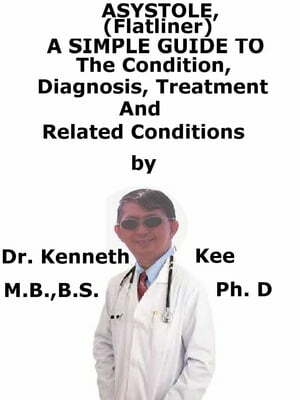 Collins Booksellers - Asystole, (Flatliner) A Simple Guide To The Condition, Diagnosis, Treatment And Related Conditions by Kenneth Kee, 9781370191857. Buy this book online. Flatliners is a movie where 5 medical students stop their heart beat by using electric shock to their heart for longer and longer periods of time before being resuscitated back by their friends. I saw the 1990 version of this movie. It was particularly interesting for me as a medical doctor. Apparently there is 2017 version of this movie. A cardiac flatline is the state of total cessation of electrical activity from the heart, which means no tissue contraction from the heart muscle and therefore no blood flow to the rest of the body. While the heart is asystolic, there is no blood flow to the brain unless CPR or internal cardiac massage (when the chest is opened and the heart is manually compressed) is performed, and even then it is a small amount. After many emergency treatments have been applied but the heart is still unresponsive, it is time to consider pronouncing the patient dead. Even in the rare case that a rhythm reappears, if asystole has persisted for fifteen minutes or more, the brain will have been deprived of oxygen long enough to cause brain death. Cardiac arrest (unlike asystole) is brought on by irregular beating of the heart that causes it to stop supplying blood flow to the other organs, including the brain. Asystole is completely different from cardiac arrest. Asystole is a critical type of cardiac arrest in which the heart stops beating and there is no electrical activity in the heart. As a result, the heart is at a total stop. When a person goes into asystole, the person must be rapidly revived using CPR.